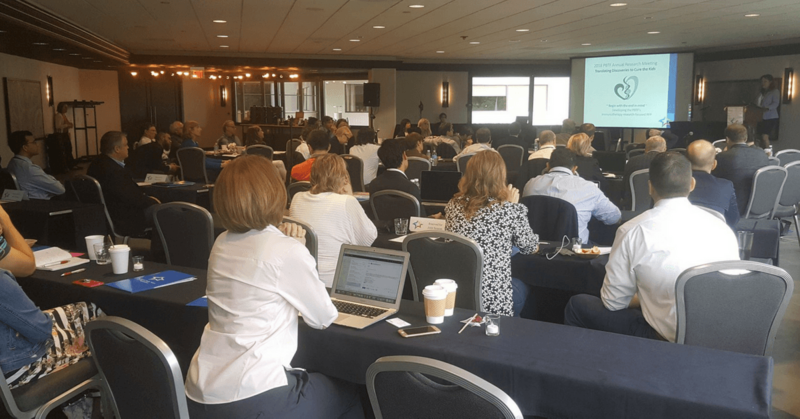 Forty-four researchers and 20 leaders from the nonprofit community gathered in Portland, Oregon earlier this month for the Pediatric Brain Tumor Foundation’s annual Translating Discoveries to Cure the Kids (TD2). This year’s annual scientific meeting explored the potential and challenges of treating children’s brain tumors through immunotherapy. Immunotherapy is a fundamentally different approach to treating cancer. It strengthens the immune system’s arsenal to fight cancer cells and makes those cells better targets for an immune response. However, while the research community’s understanding of immunotherapy for human cancer has evolved significantly over the past 20 years, immunotherapy for brain tumors has proven more challenging. Over the course of TD2, researchers dived into three topics that will ultimately inform the PBTF’s request for proposals for our new Immunotherapy Research Initiative. TD2 began by examining the complex dynamics between the neuro-immune system, tumors and brain, and the knowledge gaps the research community still needs to fill. The immune system is highly dynamic with age, and there is a critical need for a comprehensive description of how immune cell surface phenotypes mature. Dr. Daniel Perry, PhD, of the University of Florida is undertaking a deep immune profiling effort to understand immune development and how changes develop in people from cord blood to 80+ years of age. He detailed a method he developed that converts immunophenotypes to age quantiles and generates “growth charts” for the pediatric immune system. This innovation may lead to more effective immune monitoring and selection of optimal immunotherapies. Another part of this first session was dedicated to exploring neoantigens. Tumors are driven by genetic mutations in normal cells, some of which lead to the formation of molecules that the immune system pegs as “foreign” – or neoantigens. These neoantigens didn’t exist during the immune system's development so tumor cells that display them on their surface are subject to immune attack. They can potentially be leveraged as targets for personalized, precision cancer medicine in pediatric brain tumors. Other major discussion topics included new ways to assess the impact of immunotherapy on the infiltration of functional immune cells into the tumor and the special molecular features tumors possess that help them evade the immune system. “It’s imperative we develop methods to understand tumor progression before, during and after treatment,” said Samuel H. Cheshier, MD, PhD, of the University of Utah during his presentation in the mid-day session. For instance, tumors sometimes appear to “grow” at the onset of immune therapy. This pseudo-progression can be deceptive and doesn’t necessarily mean a treatment is ineffective. To address tumor behaviors like this, the second session focused on different types of tools and methods that could prove useful for monitoring brain tumors’ response to immunotherapy treatments. These methods included advanced imaging techniques to delineate immune-related inflammatory response from a growing tumor; humanized mouse models to study tumor biology; radiologic imaging and immunostaining; and ferumoxytol as a potential MRI biomarker for brain tumor macrophages. TD2’s afternoon session took a look at ongoing research into immune-oncology therapy, featuring presentations by Gregory Friedman, MD, University of Alabama, Birmingham, and David M. Ashley, MBBS, FRACP, PhD, Duke University, on treating tumors with oncolytic viral therapies and Giedre Krenciute, PhD, St. Jude Children’s Research Hospital, and Christine Brown, PhD, City of Hope, on developments in Chimeric Antigen Receptor (CAR) T-cell therapy. 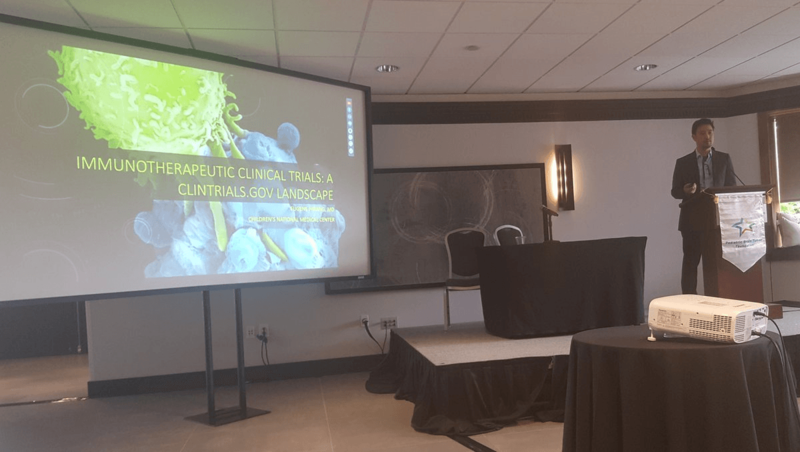 Clinical trials are “not about getting a new grant or a new journal article, but a cured child,” said Eugene Hwang, MD, Children’s National Health System, during his overview of past and current immunotherapy clinical trials for children with brain tumors. "Looking at the landscape of immunotherapy clinical trials will help us plan for the future." To help researchers spend more time in the lab and less time applying for funds, the PBTF continues to forge alliances and partnerships. As researchers met at TD2, representatives from Meghan Rose Bradley Foundation, Be Brave For Life Foundation, The Connecticut Brain Tumor Alliance, Inc., Mithil Prasad Foundation, N8 Pediatric Brain Tumor Foundation, Kyrie Foundation and Pat Mac's Pack collaborated on ways to better meet families’ needs. At the end of the day, both groups came together to ask each other the questions needed to shape the path forward -- a path where all children thrive. The time is right to fund this field of study on a much larger scale. The PBTF’s Immunotherapy Research Initiative will fill in these knowledge gaps -- providing a more informed perspective on the potential applications of this therapeutic approach and minimizing the challenges that often plague drug development for childhood brain tumors. Click here to learn more about our two-part, $2 million investment in immunotherapy research and donate today to help make this research possible.